Born on October 13, 1963 in Leningrad. - 1985: Honours Diploma of higher education IV no. 927145 issued by Leningrad State Univerity (USSR) on June 28, 1985, speciality: Orientalist & Historian (History of the Arab Countries). - 1991: Ph.D. Diploma in History (Diploma of the “Candidate of Historical Sciences”) KD no. 031399 issued on behalf of the Supreme Certifying Committee attached to the USSR Council of Ministers on February 27, 1991; the Ph.D. thesis was maintained on November 16, 1990 at the Institute of Oriental Studies of the USSR Academy of Sciences (Leningrad Branch). 01.08.1985 - 15.09.1986: Librarian at the Library of the USSR Academy of Sciences, Leningrad. 16.09.1986 - 01.08.1990: Inspector at the Customs office of the International airport Pulkovo-2, Leningrad. 03.08.1990 - 15.05.1992: Member of the technical staff at the Institute of Oriental Studies of the Russian (formerly – USSR) Academy of Sciences, St. Petersburg (formerly – Leningrad) Branch. 15.05.1992 - 01.06.1996: Assistant Researcher at the Institute of Oriental Studies of the Russian Academy of Sciences (St. Petersburg Branch). 01.06.1996 - 08.06.1998: Researcher in the Institute of Oriental Studies of the Russian Academy of Sciences (St. Petersburg Branch). 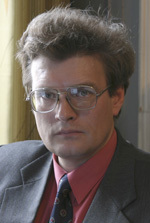 08.06.1998 - spring 2012 - Senior Researcher in the Institute of Oriental Studies of the Russian Academy of Sciences (St. Petersburg Branch). From spring 2012, Head of the Section of Near Eastern Studies, the Department of Near Eastern and Midle Eastern Studies, the IOM RAS. Ph.D. (“Candidate of Historical Sciences”) Thesis Sotsial’no-politicheskaja istoria Hadramauta v rannee srednevekov’e (The Socio-Political History of Hadramawt in early Middle Ages). Leningrad, 1990, 210 p. (typewriting). The synopsis of thesis was published as a separate booklet: Leningrad, 1990, 28 p. The thesis’ tutor was Dr. Piotr A. Gryaznevich. - November 2004, November 2005: Epigraphist of the Russian Arachaeological Mission in the Republic of Yemen which excavated the temple of the god Siyân (Raybûn VI, Hadramawt). - November 2007: Epigraphist of the Russian Arachaeological Mission in the Republic of Yemen which excavated the temple of the goddess Dhât Himyam (Raybûn V, Hadramawt). 2007 - the medal of St. Macarius, the Metropolitan of Moscow. Fields of special interest: Sabaean studies (Languages, history and culture of ancient South Arabia), Mediaeval history of Yemen, Early history of the Caliphate, Arab Christian studies (especially, Arabic Christian manuscripts' tradition), Ancient and mediaeval history and culture of Ethiopia (with a particular interest for Ethiopic manuscripts). Грунтфест Я.Б., Французов С.А. Южноаравийские надписи (не издано). At the Department of Ancient Eastern Studies, the PhD dissertation by M.A. Redina-Thomas Provincial Administration in Kassite Babylonia in the 14th-13th centuries B.C. (on the Material of Nippur Archives will be discussed.